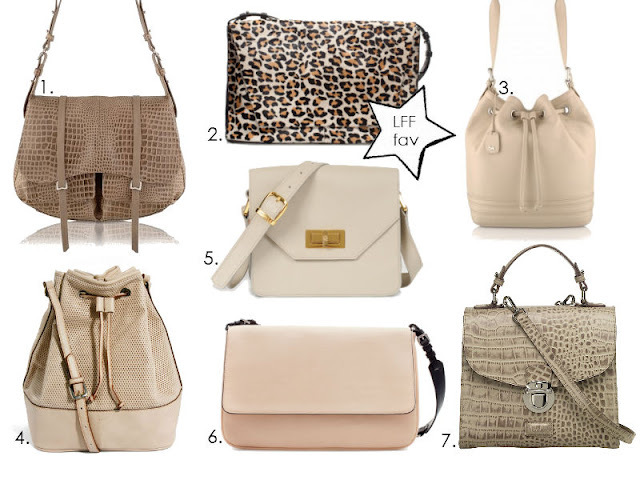 When shopping for a summer handbag, I try to look for relaxed styles that fit the lighter mood of the season. I find that dark leathers and structured shapes don’t tend to work for S/S because they jar against all the loose and floaty fabrics in my wardrobe. At the moment LFF is loving cross-body and shoulder strap bags; not only are practical for rushing about London on public transport (I like to keep my hands free to hang on for dear life on the tube), they are also a key trend for the season. 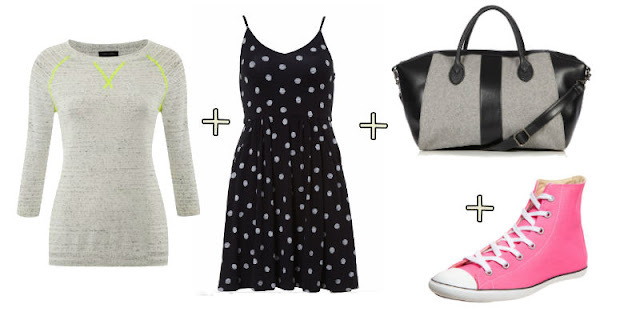 Another key style for SS13 is the sportswear inspired 'duffel' bag- (numbers 3. and 4.). Formerly reserved for your gym kit, the humble duffel bag has been given an upgrade for the season with soft leathers and minimalist shapes. Colour-wise, I recommend looking out for leathers in neutural hues of mushroom, cream and taupe that will work with lighter summer fabrics. Reptile-effect leathers and animal prints also feature in my edit because they will add a touch of luxe to just about any look. Subtle hardware details smarten up the look too (see the simple yet stylish gold turnlock on Bobelle's Berkeley, no. 5.) , but I try avoid anything too metal-heavy because this only leads to backache! What style of handbag will you be sporting this in summer? 1. Grosvenor shoulder bag in Marsupial, Radley, £299. 2. Square leather leopard print messenger, Zara £59.99. 3. Buttermere drawstring bag in Cotton, Radley, £189. 4. Mango perforated cross body duffel, ASOS, £34.99. 5. Berkeley bag in Mushroom, Bobelle London, £395. 6. City bag with handles & buckles, Zara, £39.99. 7. Osprey London Maudie croc print satchel, John Lewis, £245. The SS13 mid season sales are in full swing, and there's plenty of bargains left online and instore. Here's the LFF edit of the pieces that will work for high summer whilst subtly nodding to AW13 key trends. 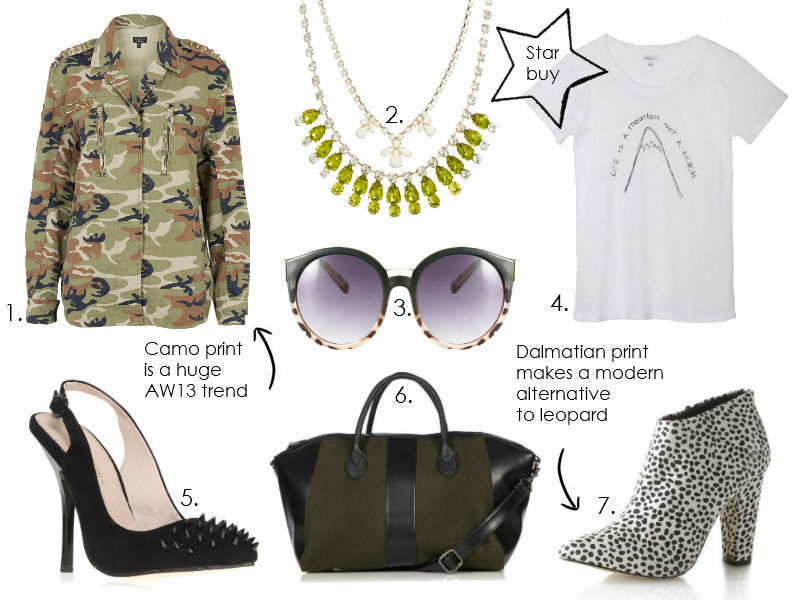 The military trend looks set to be huge for AW13, so investing in some camo print right now is a sensible move. 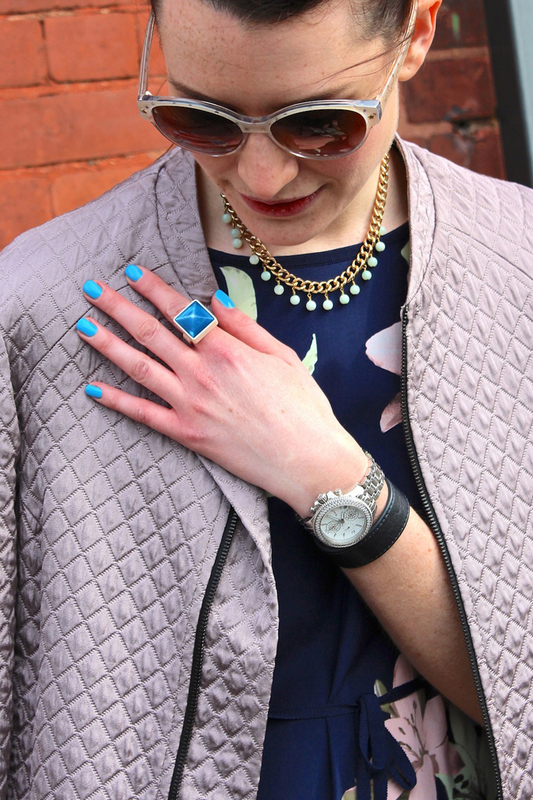 This Topshop jacket is lightweight and ideal for S/S(1.) Green also looks set to be a huge colour trend next season, add a touch to your look with a jewelled necklace (2.) or khaki tote (6.). If you love a bit of leopard, then the dalmatian print trend offers a modern alternative. LFF loves these Stylistpick booties! 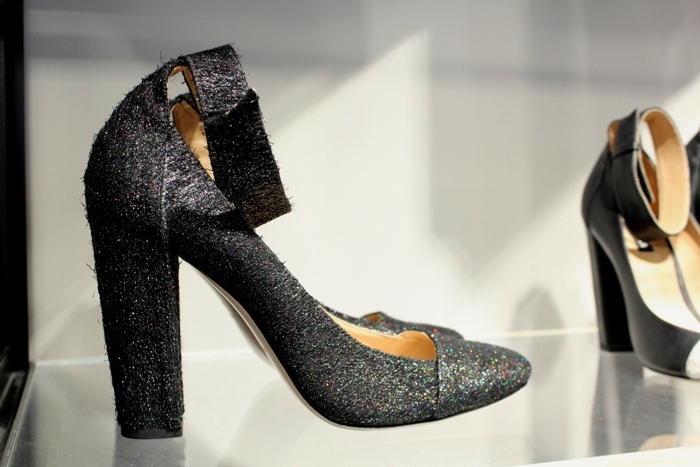 Have you been shopping the mid-season sales? 1. Gold studded camo jacket, Topshop, was £58 now £30. 2. Limited edition necklace multipack, ASOS, was £50 now £40. 3. Round metal detail sunglasses, ASOS, was £12 now £7. 4. Life white slogan t-shirt, StylistPick, was £18 now £10. 5. Culprit court shoes, Kurt Geiger, was £140 now £49. 6. Augusta holdall in Khaki, StylistPick, was £40 now £18. 7. Eleanor Dalmatian print boots, StylistPick, was £35 now £15. 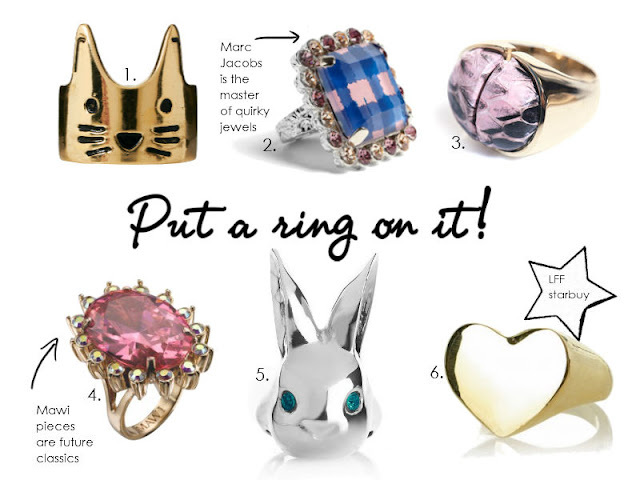 I love a playful and chunky statement ring. I picked up the below Marc by Marc Jacobs number on a university trip to IFC Mall, Hong Kong, in 2008 and I have worn it religiously since (it also brings back some happy memories of fun times with my fashionista coursemates). I'm aware it's not to everyone's tastes, some people love it and some don't get the bordering-on-kitsch vibe, but it never fails to attract comments. 1. Cat face ring, ASOS, £6. 2. Marc by Marc Jacobs Antoine ring, my-wardrobe.com, £80. 3. Nina Ricci Watersnake ring, Matches, £180. 4. Large Daisy gemstone ring, Mawi, £215. 5. Bright Eyes silver rabbit ring, Myflashtrash.com, £25. 6. Trudy heart ring, StylistPick, £5. When Uniqlo offered me the opportunity to style a piece from their recent Celia Birtwell collaboration, I jumped at the chance. Celia Birtwell is a legendary textile designer whose iconic prints epitomised the 60s/70s. And I am happy to report her Uniqlo collection is sartorial perfection. Not only is the collection gorgeous and wearable but the price points are extremely affordable too, starting at £9.90 for a printed scarf and ranging up to £29.90 for a shirt dress. With such good value on offer, I would highly recommend investing in a capsule collection of 3 or 4 pieces to mix and match in your Summer wardrobe. 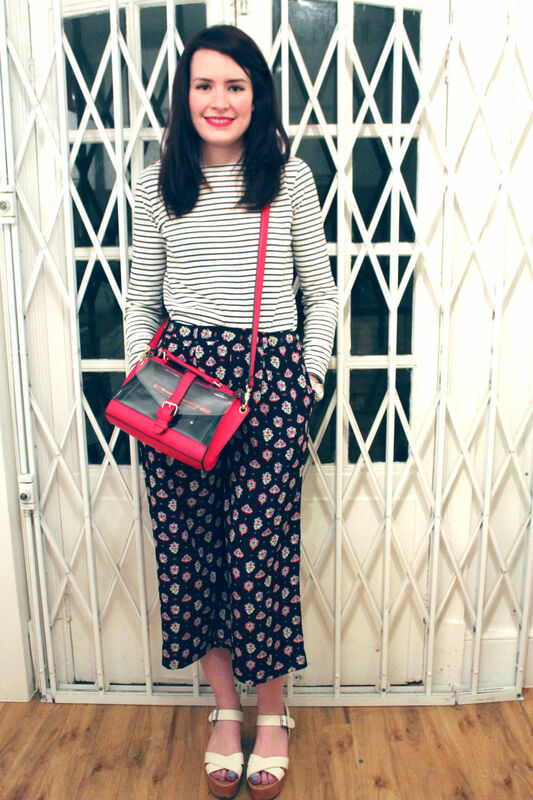 I opted for a pair of pyjama pants (designed for daywear) having ogled them in the Grazia fashion charts. With an elasticated waist and relaxed shape they are extremely comfortable and easy to wear. 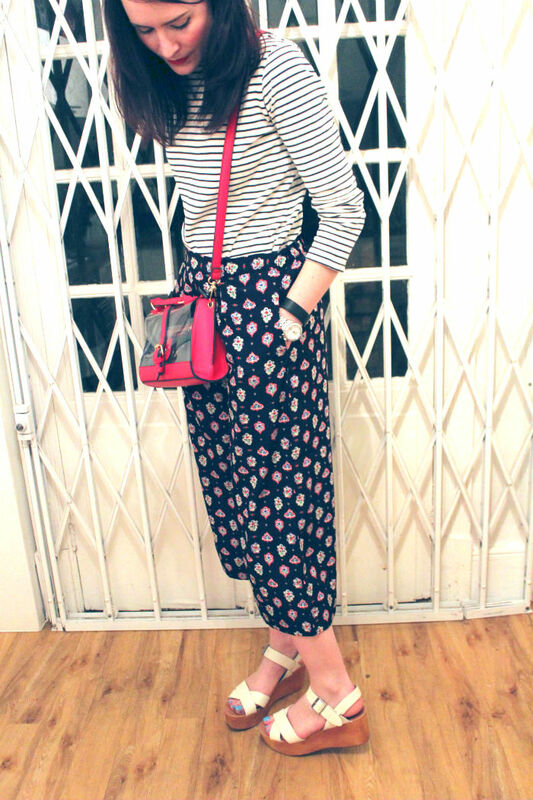 With a skirt/trew hybrid such as these, I recommend treating them like a midi skirt if you are looking for styling ideas. However, they are definitely a spring/summer style so I wouldn’t recommend wearing them with tights. 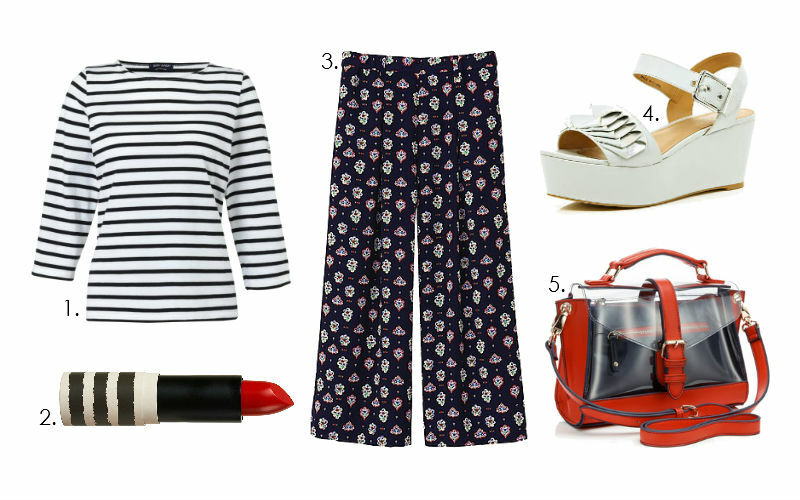 I’ve paired mine with a modern classic: the Breton tee (mine is Uniqlo) for a subtle print clash. The pants would look great with a flat ballet pump or a pointed court, but I have opted for my Aldo flatforms with mine for an east-meets-west feel. 1. (Similar) Saint James Galathee tee, Atterley Road, £53. 2. 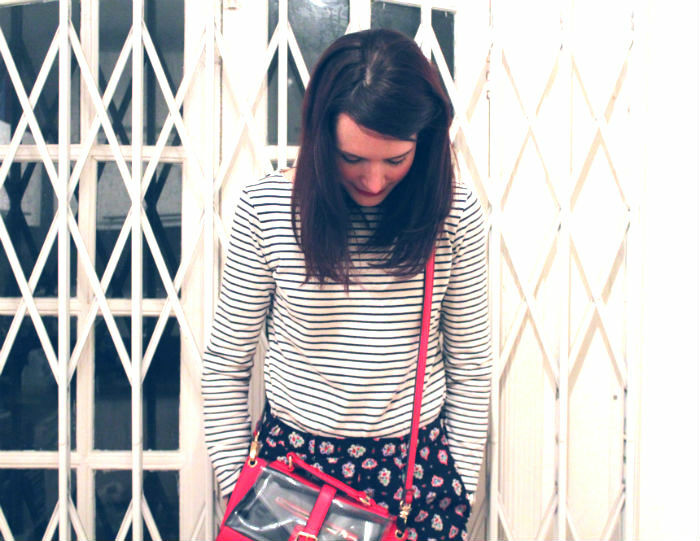 Lipstick in Rio Rio, Topshop, £8. 3. Pyjama pants, Celia Birtwell for Uniqlo, £19.90. 4. (Similar) White Georgia Hardinge flatforms, River Island, £50. 5. 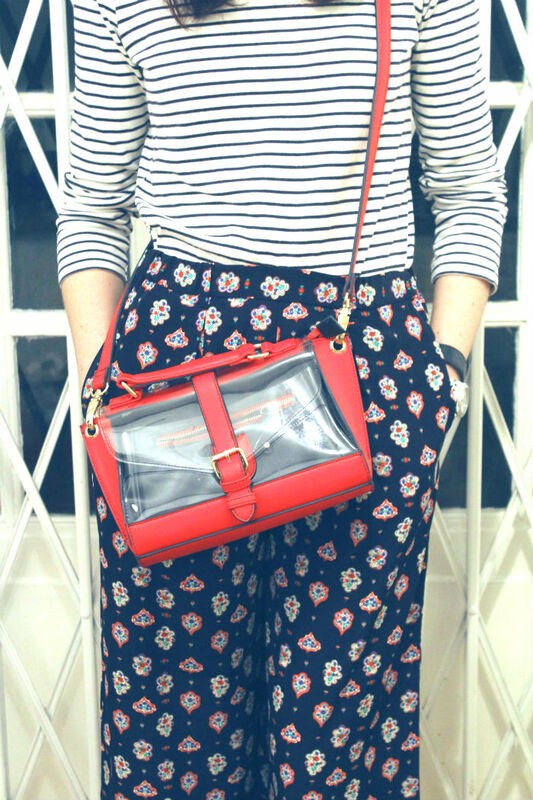 Hamptoms Perspex Satchel, Accessorize, £32. Uniqlo are running an Instagram competition at the moment to celebrate the Celia Birtwell collaboration. To enter all you have to do is style an outfit featuring your Celia Birtwell purchases and hashtag it with #styledincelia. The competition will be judged by Celia herself with an exclusive signed Celia Birtwell print and 5 signed Celia Birtwell books up for grabs. The deadline is the 18th April so get Instagramming! Recently TK Maxx kindly offered me the opportunity to choose and review a dress and a pair of shoes from their website. I love a good rummage in TK Maxx (especially fantasy shopping the Gold Label section) and was excited to discover how the website compared. As with the in-store experience there’s a degree of ‘rummaging’ involved with shopping the TK Maxx site, as not all sizes are available in all styles. You can filter products by size which I would recommend you do to save time. I chose a polka dot strappy sundress (£19.99) and a pair of colour-pop pink high-tops (£24) to feed my current trainer addiction. What I like about TK Maxx is the quality you receive for your pennies. The sundress is made from good quality thick jersey (I’m a fabric geek) and the hi-tops are an amazing price for branded trainers. To style the look for now (ie. cold weather! 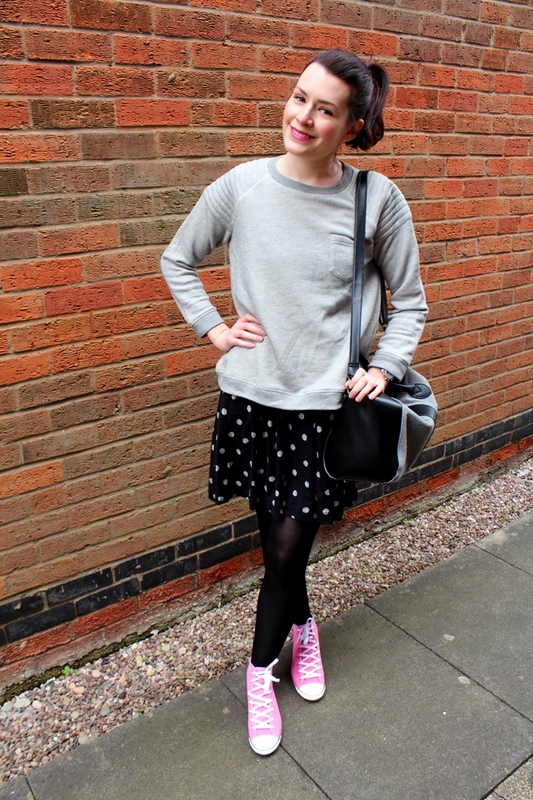 ), I've gone for a sporty preppy outfit, layering my Whistles grey marl sweater over the dress for warmth. I added my StylistPick felt Augusta bowling bag to complete the collegiate look. Ps. If I look tired here it's because I have a horrible cold that has given me a puffy face- Oh the joys of our prolonged winter! 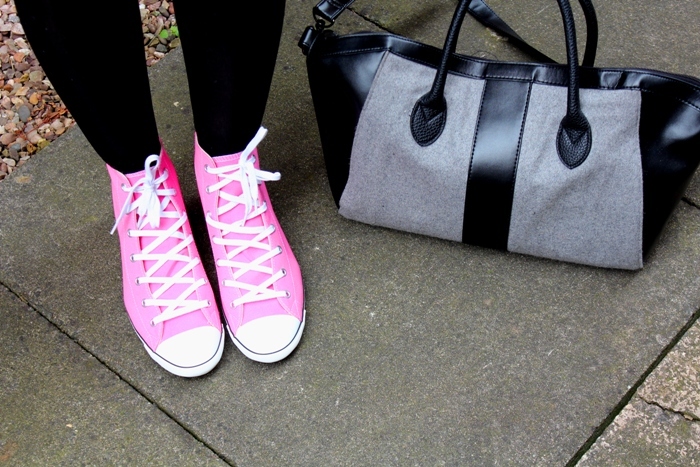 Dress c/o TK Maxx, High-tops c/o TK Maxx, Augusta Bag c/o StylistPick, Grey marl sweater: Whistles. I love that the sundress has pockets! The little details make all the difference! 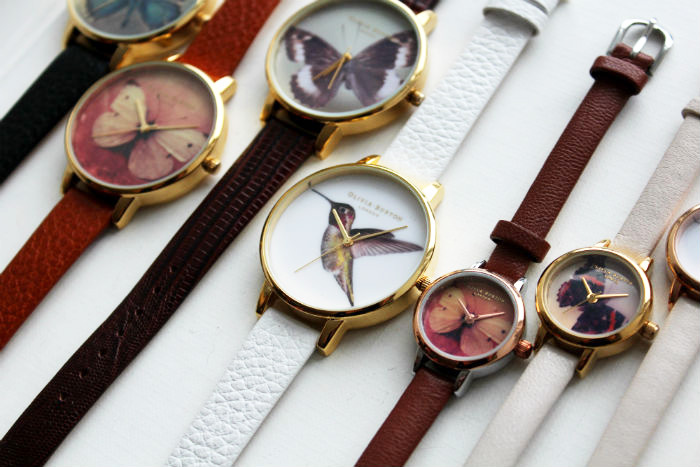 Shop the TK Maxx online collection here.